On New Years Eve 2011 artist Bruno van den Elshout launches his camera-machine on the roof of a hotel on the beach in The Hague (NL). His goal is to capture the North Sea-horizon one year round. In the middle of an economic crisis the horizon provides us with a stable and calming counterpart, such is his thought. The camera-machine takes a picture of the horizon once every hour of 2012. That’s 8,785 images. When these images start to arrive from the machine, the horizon suddenly reveals his surprisingly overwhelming appearance. Gray, grim, ordinary, or wild, waving, with skies reminiscent of The Hague School paintings in the late 19th century. Sometimes tranquil misty, unreal calm or bombastically colorful. The result is an incredibly surprising collection of images. What began as a seemingly random idea grows through various exhibitions and beach expeditions into a major project; a work-of-art-in-book-form that reflects the adventure to which our own horizon invited us. 212 pages with 500 pictures of the horizon, rhythmically and melodically composed into a story without text. 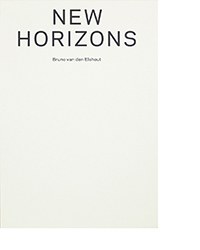 With this book, artist Bruno van den Elshout tells the story of adventure and how to fully enter it. How it arises, how it unfolds and where it takes you. About courage, doubt and discovery. How bold steps can transform into giant strides. On how to make work of your dreams.